This exceptionally fine essay was written by Francis Story and published in a Buddhist magazine here in Singapore years ago. I reproduce parts of it here hoping that it moves you as much as it does me. 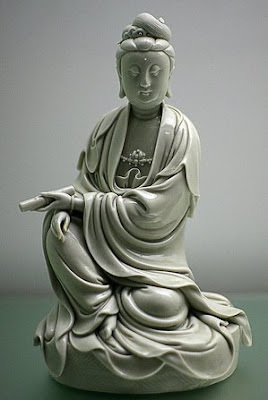 Even those who do not know her, the gracious figure of Kwan-yin, in painting, sculpture, metal work or delicate porcelain, conveys something of the spiritual meaning that like an aura of infinite love surrounds her name. It is present in every flowing line of the robe that clothes her, in the graceful shape of her hands, the serene yet tender expression of the oval face, even in the slender, naked feet, one of which rests on the open lotus that is her throne. The whole figure is serene and full of repose, yet at the same time instinct with life, and a soft light seems to spread all about it, as though the rays of compassion are kindled within, to suffuse the world of living beings. Generations of artists have found inspiration for their noblest work in the figure of Kwan-yin; generations of craftsmen have expended their patient skill on the loving creation of her form; and for centuries men and women have turned to her image as the embodiment of their longing for a better, purer life. Lovely and gracious as her figure is, there is nothing in it of sensuality; it seems to be pure spirit, radiant with an ethereal beauty, its form and substance a transmutation into something finer than the gross materials on earth. She, who is mercy incarnate, shed no tears. Her compassion is not that of an emotion or a passing mood; it has its being in the profound stillness of the heart, where dwells knowledge and understanding. The tranquil face of Kwan-yin reflects the nature of infinite peace, of she who has no desire but to remove the distress of others must herself be undistracted. She lives in the world, suffers with the world, but does not depart from the eternal Void. Yet there is something awe-inspiring in the thought of a compassion that is completely undiscriminating, a compassion that looks upon all alike – the judge and the criminal, the executioner and the executed, the torturer and the man undergoing torture – and sees them all in a clear and equal light as victims of a self-created situation. Can that godlike dispassion in compassion be likened in any way to the pity that we know, the human pity mixed with hatred of the cause of the suffering? Or is it that we, who have never looked upon injustice without anger, have never known what true compassion is? Ah, All-merciful One, teach us the love that does not hate! Teach us the pity that does not destroy! Teach us the wisdom that does not scorn! And if man, infatuated by the Ten Thousand Things, cannot learn, let us look upon your image and know that there is hope for the world. Quite lovely and evocative! How to reconcile it, however, with the Kwan Yin images with their multiple arms, each holding an implement of expedient means -- an arrow, a noose, a lotus, a lance, a mirror, a thunderbolt? Dear Ken and Visakha,if you look carefully you will notice that the palm of each of Avalokitesvara’s many arms has an eye, symbolizing the bodhisattva’s infinite ability to see the distress of beings and reach out and help. The objects help in all those hands likewise symbolize various things such as strength, joy, the bonds of friendship, the piercing quality of knowledge, etc. I’m not generally comfortable with ‘symbolism’,it gives too much scope for us to make everything mean what ‘I’ want it to mean. However, I would have to admit that the symbolism of the many-armed Avalokitesvara is both powerful and apt.